Lava Zone 2. Water Catchment systems for homes. SSPP is 2347.00 to hook up to Helco. 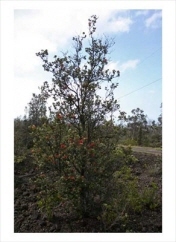 Exterior Features Nicely located "FAT" lot located on Catamaran just above Kona Drive Has large ohia trees and good potential for ocean views. Located in Hawaiian Ocean View Estates in the Ka'u District. Near shopping in Ocean View Hawaii. Small community with two grocery stores, gas stations, hardware store, laundry mat, restaurants, post office, and other businesses in area.